I haven't done a hiking post in awhile, but now that I've returned, I can share some things I've learned. Like things about leeches. 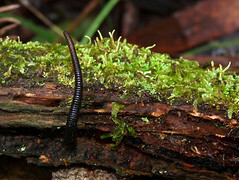 Leech photo taken by Lorraine Phelan, Flickr. Looking at my awesome leech socks. Yes, leeches. They look like large inch worms, and they move like them too, until you pull them off your leech socks. Apparently, they can't bite through the skin of your palm, since it's too thick. So, lucky me, I was pulling leeches off my clothing with my bare hands! I took a guided jungle trekking tour through Khao Yai National Park in Thailand, with Greenleaf Guesthouse & Tour, and it was amazing. I saw horn-billed toucans in their natural habitat! ...along with a whole bunch of other creatures. 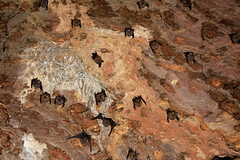 There were two million bats that took hours to all exit their cave, there was springwater swimming, grasslands, strangling trees, waterfalls, and lots and lots of mud. 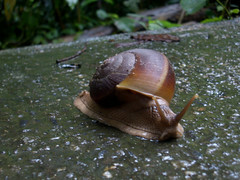 July is Thailand's rainy season after all. 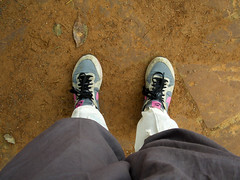 Let's just say I had to "retire" my red-clay-caked sneakers at the end of this hike. 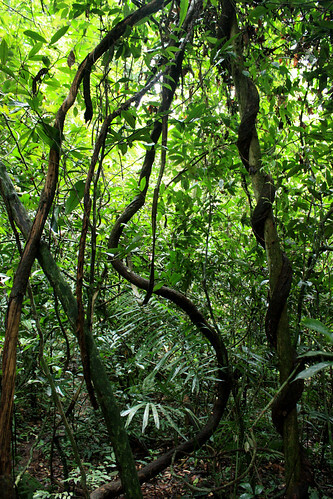 The jungle was just gorgeous. Well worth the leech-removal effort. 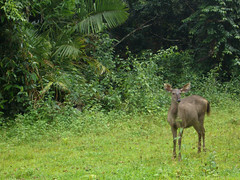 More photos of Khao Yai National Park on my flickr account. This is amazing!! I would brave some leechiness for those views, most definitely! Wow, what a wonderful hike! I'm so jealous you got to see all those animals! This reminds me a lot of Costa Rica. 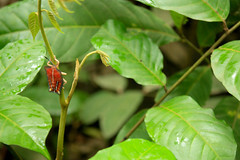 Perhaps all jungles are similar, but I assure you, Thailand is not all that much like Costa Rica. Well, beaches and jungles, but Buddhist temples? Great pics! 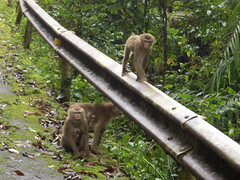 Macaques! 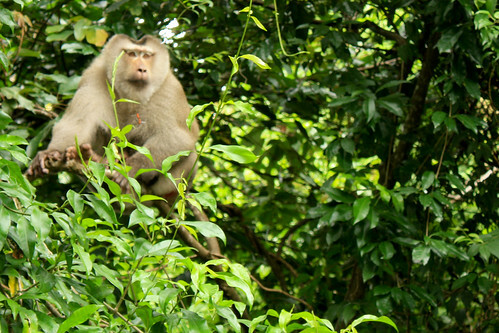 I haven't even thought of those in so long - welcome back in, monkey friends! I am so jealous. though maybe not about the leeches.. your pictures are gorgeous. take me with you? I just found your blog (and this post) through a comment you made on Kitchen blog. 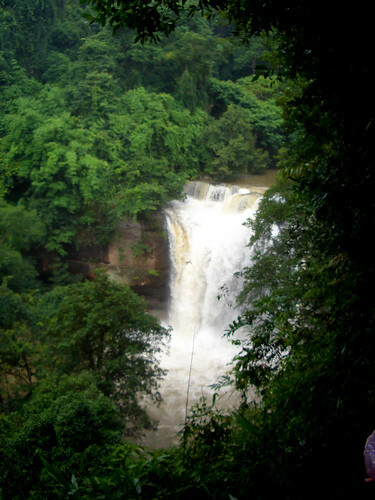 I have never heard of anyone else who's been to Khao Yai! I went there in 1990 and still have the T-shirt. I had a bad leach experience too, a very close call with elephants (as in, they almost ran us over), and we heard tigers in the night. We camped overnight in a tower there and had rats running all over our sleeping bags. And on the last day, we ran into some poachers - fortunately a ranger team was there too. Lots of adventures! 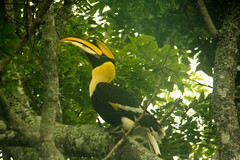 Loved the hornbills and the roar of the tigers at night - magical! 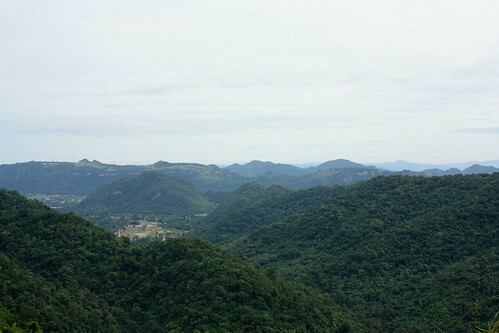 Victoria- That sounds like an awesome, awesome experience at Khao Yai to me!! !